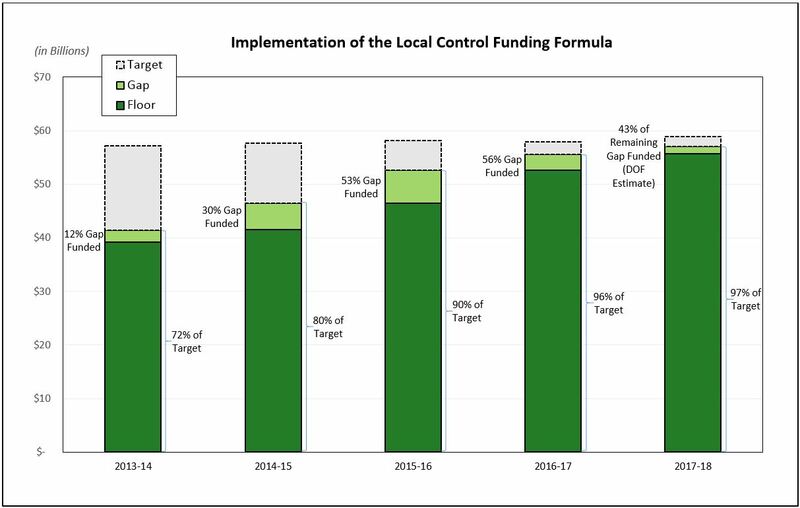 Information about the funding provisions of the Local Control Funding Formula. The local control funding formula (LCFF) was enacted in 2013–14, and it replaced the previous kindergarten through grade 12 (K–12) finance system which had been in existence for roughly 40 years. For school districts and charter schools, the LCFF establishes base, supplemental, and concentration grants in place of the myriad of previously existing K–12 funding streams, including revenue limits, general purpose block grants, and most of the 50-plus state categorical programs that existed at the time. For county offices of education (COEs), the LCFF establishes separate funding streams for oversight activities and instructional programs. Original estimates provided by the Department of Finance (DOF) in 2013–14 indicated there would be an additional state cost of approximately $18 billion, which included $58 million for COEs. DOF estimated it would take eight years to fully phase in the new funding formula for school districts and charter schools, and it would take two years to fully phase in the new formula for COEs. Provides a uniform base grant for each school district and charter school per unit of average daily attendance (ADA), based on the grade span of the pupils, i.e. kindergarten through grade 3 (K–3), grades 4–6, grades 7–8 and grades 9–12. Provides an adjustment of 10.4 percent on the base grant amount for K–3. As a condition of receiving these funds, school districts are required to make progress toward an average class enrollment of no more than 24 pupils in K-3 classes, unless the district has collectively bargained an annual alternative average class enrollment in those grades for each school site. Charter schools do not have to comply with this condition. Provides an adjustment of 2.6 percent on the base grant amount for grades 9–12; there are no compliance requirements associated with this adjustment. Provides a supplemental grant equal to 20 percent of the adjusted base grant multiplied by ADA and the unduplicated percentage of targeted disadvantaged pupils. Targeted pupils are those classified as English learners (EL), meet income requirements to receive a free or reduced-price meal (FRPM), foster youth, or any combination of these factors (unduplicated count). Provides a concentration grant equal to 50 percent of the adjusted base grant multiplied by ADA and the percentage of targeted pupils exceeding 55 percent of a local educational agency’s (LEA) enrollment. Provides for additional “economic recovery target” funding for a small number of school districts and charter schools to ensure that virtually all districts and charters are at least restored to their pre-recession funding levels (adjusted for inflation). Guarantees a minimum amount of state aid to school districts and charter schools based on the amount of state aid they received in 2012–13. The calculation is adjusted for changes in local revenue and ADA. Maintains Home-to-School Transportation and Targeted Instructional Improvement Block Grant funding as add-ons to the adjusted base grants in the LCFF target, based on amounts received in 2012–13, and requires that 2012–13 expenditure levels continue to be maintained for Home-to-School Transportation. A summary of the current LCFF target amounts, as well as other current funding information, can be seen on the Funding Rates and Information Web page. Figure 1 provides a summary of the amounts provided to date to support implementation of the LCFF. Until full implementation, LEAs will receive roughly the same amount of funding they received prior to the LCFF phase in which began in 2012–13, plus an additional amount each year to bridge the gap between prior funding levels and the new LCFF target levels. *Note: Amount calculated by CDE as of each year's Budget Act. Figures may not sum due to changes between years for growth and cost-of-living adjustments (COLA). As of the 2017–18 Budget Act, school districts and charter schools are receiving on average 97 percent of their LCFF targets, as indicated in Figure 2. On an individual LEA basis, however, there is a wide variation on how much of their full LCFF target funding individual school districts and charter schools are receiving. This variation is due to the fact that when LCFF implementation began, individual districts and charter schools were all at different distances from their LCFF targets. While some were close to or even already above their LCFF target, others were quite far away. Since all receive the same percentage of their need each year, some get a significant amount of gap funding each year during the phase in period while others get very little, and all should get to their LCFF target at about the same time, with certain exceptions. Figure 3 shows the range in LCFF transition funding as a percentage of LCFF target entitlements received in 2016–17 by individual districts and charter schools. Note: No district or charter was funded below 90 percent of its Target in 2016–17. COEs were provided $32 million in gap funding for 2013–14 and $25.9 million for 2014–15, and as of 2014–15, COE LCFF targets are fully funded. COEs receive LCFF funding through a two-part formula for oversight responsibilities and instructional programs. Like school districts and charter schools, LCFF also guarantees for COEs a minimum amount of state aid based on what they each received in 2012–13, to hold those COEs harmless if the new formula yields less than what they were receiving prior to LCFF. The oversight responsibilities are funded through a COE operations grant, with amounts based on (1) a minimum grant per county, (2) the number of school districts in the county, and (3) the ADA in the county attributable to school districts, charter schools, and schools operated by the county superintendent. Provides a uniform base grant per ADA for certain pupils served by county offices (on probation, probation referred, and expelled pursuant to EC Section 48915 (a) or (c)). In addition to the base grant, COEs receive a supplemental grant equal to 35 percent of the base grant multiplied by ADA and the unduplicated percentage of targeted disadvantaged pupils. Targeted pupils are those classified as English learners (EL), meet income requirements to receive a free or reduced-price meal (FRPM), foster youth, or any combination of these factors (unduplicated count). COEs also receive a concentration grant equal to 35 percent of the base grant multiplied by ADA and the unduplicated percentage of targeted students exceeding 50 percent of enrollment. Provides a uniform base grant per ADA for juvenile court school pupils. Additionally, all juvenile court school pupils are deemed to be eligible for the supplemental and concentration grants provided for unduplicated pupils. The supplemental grant is equal to 35 percent of the base grant multiplied by ADA, and the concentration grant is equal to 35 percent of the base grant multiplied by ADA and 50 percent of the juvenile court school enrollment. Other pupils served by COEs are funded based on the LCFF funding of their home school district. A summary of the current COE operations grant and alternative education grant amounts, as well as other current funding information, can be seen at the Funding Rates and Information Web page. For all LCFF fiscal questions, contact the Principal Apportionment Section at PASE@cde.ca.gov. For all LCFF program questions, contact the Local Agency Systems Support Office at LCFF@cde.ca.gov. California's new school funding and accountability system, enacted in 2013.